The purpose of the Shredder is to reduce the size and volume of the solid waste. Single shaft shredders are best used as secondary shredder for a particular size requirement. The shredders are provided with large diameter rotor and hydraulic system for the ram pusher and swing type sieve cleaning. The high precision cutters can be turned once the side is worn out. The knives are installed at the appropriate position for fine shredding. The output material size is as per the screen installed. Screen size can be custom built as per customer and as per application requirement. The shredder can shred various types of wastes up to 5000 kgs/hr. Alfa Therm Results In minimal power consumption and reduced noise when compared with other types of shredders, whilst achieving high throughput rates and maintenance costs. Our company is the leading name known for providing Plastic Lumps Shredder Machine to the clients. 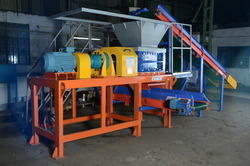 This product is used for cutting and crushing plastic waste. Plastic Shredder Machine is manufactured by quality controllers under the firm observation of the expert professional using high quality material. Offered range is available in different specifications as per the requirements. We have gained appreciation as a well-known enterprise, devotedly betrothed in offering a broad variety of Pet Bottle Shredder. Offered products are extensively used in commercial industry for diverse purposes. Offered products are available from us at competitive prices in various technical specifications. With several years of experience in this domain, we are specialized in presenting a broad range of Sugarcane Trash Shredder to our customers. 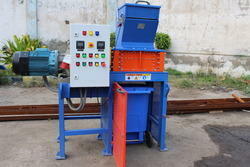 For meeting the precise needs of our patrons, we render our patrons with the best quality of Plastic Waste Shredder . Available with us in all the standard sizes and specifications, the rendered plastic waste shredder is known for its excellent plastic waste shredding capacity. Easy operations and low maintenance, makes the plastic waste shredding highly demanded in market. 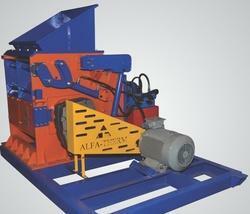 Alfa therm Ltd is manufacturing and supplying different capacity wood shredder machines. These Shredders are designed by our expert Engineers to ensure its high performance in shredding the wood waste material and reducing the volume of solid waste. Highly treasured for its offered features, this machine suite in many ways for fuels and waste reduction. Security and recycling are the hottest items in the world of E-Waste today.